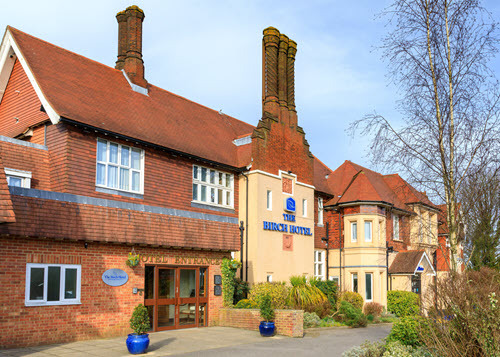 The Birch Hotel is an independent hotel in the mid-Sussex town of Haywards Heath. It is located on the A272 which gives easy access to the A23/M23. It is 5 miles from Burgess Hill, 16 miles from Gatwick Airport, 14 miles from Brighton and 40 miles from central London. The main shopping and commercial district of Haywards Heath is ¾ mile away. The hotel is immediately opposite the Princess Royal Hospital. The hotel is ideal for both business and leisure stays and has 51 en-suite bedrooms all of which have free wireless internet access as do the public areas of the hotel. All inclusive wedding packages available on Saturdays for 50 guests from £3,400. Book by the day or half day, choose a day delegate or residential package and choose your optional extras. Whether you book a traditional family Sunday Lunch in the Courtyard Restaurant, a delicious Afternoon Tea, or a relaxed informal meal in the Bistro Bar, The Birch Hotel offers a variety of dining options all backed with quality menus, an excellent wine and drink selection and professional, caring service.